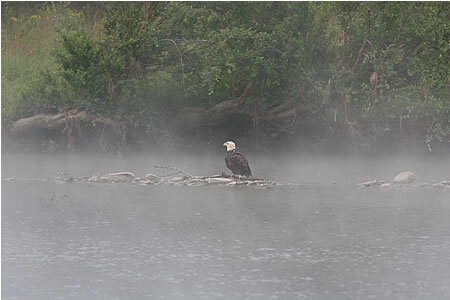 he Upper Delaware River Valley is home to New York’s largest population of Bald Eagles. Every winter, several hundred bald eagles use the valley’s trees and ridges as an over-wintering site after their long migration from summer hunting grounds in Canada . The birds feed on fish in the open waters of the Delaware river, and nest in protected roosts at night. For the rest of us, the Delaware River Valley is quickly growing into a thriving region in upstate New York, in part because of its appeal as a summer home destination. Unlike the wintering eagles, buyers come from New York, New Jersey, Pennsylvania and Connecticut in summer to enjoy the stunning scenery, fishing, hiking and summer activities in the towns along what’s called the Upper Delaware Scenic Byway. This region stretches for 73 miles along the Delaware River from Hancock in Delaware County to the north, to Port Jervis in Orange County to the south. Along the way, visitors and residents will find many quaint restaurants and cafes, galleries, theaters, museums, antique shops and general stores which are now thriving during the region’s recent renaissance. About half way between Hancock and Port Jervis is Narrowsburg, NY, a hamlet in the town of Tusten, in Sullivan County. Tucked in a valley between the Catskill and Pocono Mountains, Narrowsburg is located on the Delaware River at its Narrowsburg, NY mapdeepest point. The “Big Eddy” portion of the river reaches depths of 113 feet as it winds around the town’s periphery. . 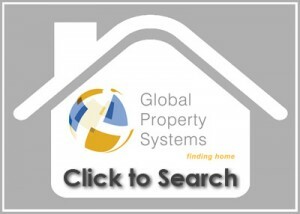 Though a small town (population 431 in the 2010 census), it offers all the goods and services of a complete suburban area. Narrowsburg has a definitely artistic flair to it. Many of its shops are galleries or craft related. It has a little Dumbo- Brooklyn vibe. Chic stores, cute cafe’s and restaurants, art galleries, and antique stores. Artists and craft-people, many of whom are New York City transplants, abound. The region buzzes with activities year around, from summer farm stands and community markets selling local goods and produce, to outdoor entertainment, festivals, fairs and family entertainment. 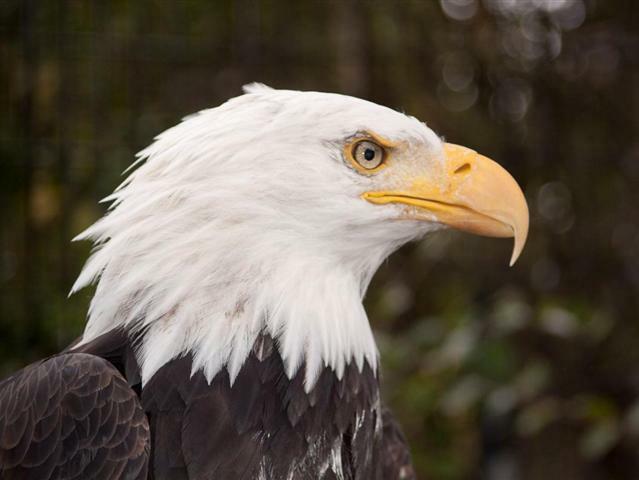 In winter, Narrowsburg celebrates its bald-headed avian visitors with its own Eagle Fest, a celebration and educational event held every January, coordinated by the Delaware Valley Eagle Alliance. 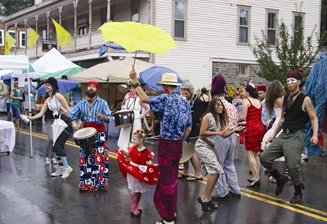 In late July, Narrowsburg holds its annual Riverfest celebration, a Sunday street fair with a 21 year history of educational programs, exhibits, music by local artists and food from area restaurants. Regional art is a focus at the fair, with local jewelers, woodworkers, textile, glass, and stone artists, a broom maker, a chain saw sculptor, painters, and photographers exhibiting. And don’t miss the parade! Outdoor recreation abounds. Fly and lake fishing is famous in the Upper Delaware. 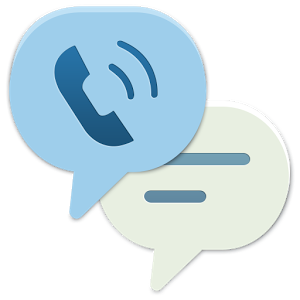 Over 50 different fishing guide services operate on the route. Species common to the Narrowsburg area waterways are Brown Trout, Lake Trout, Largemouth Bass, Smallmouth Bass, Chain Pickerel and Panfish. Walleyed Pike are also found in the Delaware River, and in the many lakes that dot the region. Crystal Lake, one of the larger lakes in the area is just east of Narrowsburg. it is a pristine example of the beautiful spring fed lakes in the area. It is a popular retreat for local residents, with its rugged beauty unspoiled by loud beaches and roaring pleasure boats. Crystal Lake is restricted to passive recreation – hiking, boating (no gasoline motors), and hunting for small game, deer, and turkey in the surrounding 498-acre Crystal Lake Forest, a state-managed wildlife preserve. Local fishermen find the lake a prime area for brook trout. It is also a favorite place to spot eagles fishing from shoreline trees. The Narrowsburg area has an ever-growing number of retail and commercial establishments serving both its year-around inhabitants and summer visitors. Pecks Markets, a regional grocery chain has five stores in area villages including Narrowsburg. Pecks sells a wide variety of fresh produce, meats, dairy and household grocery products. Each market includes an on-site bakery, making fresh cakes, pies, bread and other tempting delights. Among its other retail shops, Narrowsburg has a pharmacy, two wine shops, a coffee shop which roasts its own beans daily and serves breakfast, lunch and dinner. There is a funky mix of antique stores, galleries, gift shops and unusual retail shops to keep visitors busy for quite a while. (Nora’s Luvin’ Spoonful, a new ice cream shop, opened recently!) The Narrowsburg Chamber of Commerce lists nearly one hundred members on its retail roster. There are a lovely assortment of fine dining establishments in Narrowsburg and in nearby villages. Gerard’s River Grill on Bridge Street offers New American and Italian cuisine. Gerard’s chef emphasizes local sourcing for much of the food they serve. The restaurant offers white table cloth service, plus outdoor dining on its deck in summer. The Heron restaurant on Main Street Narrowsburg also offers dining “alfresco,” and serves a variety of American cuisine with a “grits and biscuits” Southern bent. Narrowsburg itself has four other dining establishments including two Chinese restaurants, a pizza parlor that delivers and the obligatory small town cafe. The Whistle Stop is open for breakfast, lunch and dinner, serving everything from hearty breakfasts to prime rib dinners, with a helping of all the local gossip. Not all entertainment in the area is about dining. Residents and visitors alike enjoy the adrenaline-generating experience of driving a race car on the professional auto race track in Monticello. The Monticello Motor Club offers its members over four miles of racing asphalt and a variety of layouts. The course is capable of operating as three independent circuits that can run simultaneously. The entire complex includes two separate pit facilities in addition to a skid pad area. The club offers road tests, a two-day racing school, team testing, and is used for corporate outings, press launches and manufacturer events. If horse racing is more your speed, look no further than the Monticello Casino and Racetrack. Play the ponies live, or on live simulcasts from tracks around the country. Or wager on table games and over a thousand slot machines in the 40,000 square foot casino. The casino also offers an all you can eat buffet for $13.95, a formal restaurant and a snack bar. 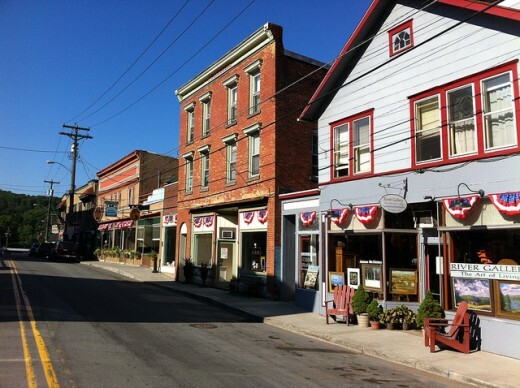 Narrowsburg and its surroundings offer many cultural opportunities as well. The Delaware Valley Arts Alliance oversees many artistic and musical events in and around Narrowsburg. It offers a lively calendar of events including art shows, movie screenings, literary events and book readings, and dance and live music ensembles in the Tusten Theater, Its art gallery is open all year, and regularly features well known artists as well as regional talent. The annual Big Eddy Film Festival held every September is a popular artistic event, showing independently produced feature films, documentaries, and shorts. The famous Bethel Woods Center for the Arts is just 15 miles north west of Narrowsburg. Built on the site of the 1969 Woodstock Concert, the venue brings nationally recognized musical talent to the region. The center offers multiple stages featuring a diverse selection of popular artists and culturally-rich performances, an award-winning museum, and educational and community programs that provide meaningful experience in arts, history and civic engagement. Just across the Delaware from Narrowsburg at Lakawaxen is the Zane Grey Museum. The author of 90 books and western novels, Grey lived in Laxawaxen, Pennsylvania for many years during the early part of his career. He was a passionate outdoor enthusiast, fishing and hunting in the woodlands around Narrowsburg. Narrowsburg is a part of the Sullivan West Central School District. The district consists of five separate schools. There are three elementary schools:Callicoon, Jeffersonville,and Narrowsburg. The Junior High School is also in Jeffersonville. Sullivan West High School, a 9 through 12th grade school in Lake Huntington has 694 students attending. The Sullivan County Community College (SUNY Sullivan), a small two-year community college that’s a part of the State University of New York system has 1,757 students enrolled, and provides housing for 400 on its 405-acre campus. The campus is located between Hurleyville and Liberty, NY off Loch Sheldrake Road. There are eleven private schools in Sullivan County, the largest of which is The Homestead School in Glen Spey, Homestead is a Montessori school with 179 students. The Narrowsburg area is a vibrant, thriving place, with plenty of culture, services and things to do. 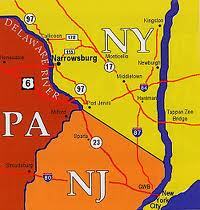 But the real draw, the reason people seek this community two hours from New York City is its great natural beauty. The views from around Narrowsburg, of the river, the mountains, the woodland and the abundance of nature itself is simply a “bucket list” fulfillment all on its own.